Estate Planning and Elder Law Guides — Talbot Law Group, P.C. Attorney Matthew Talbot explains how the Probate Court handles elder abuse matters that fall within the context of a Trust, Probate, or Conservatorship. 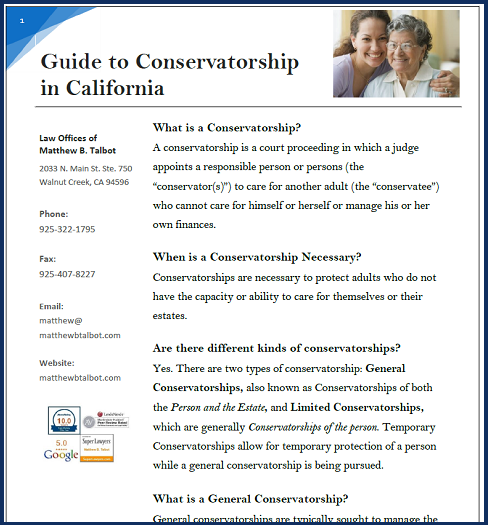 Conservatorship specialist Matthew Talbot addresses common questions and answers about the Conservatorship process in the California probate courts. 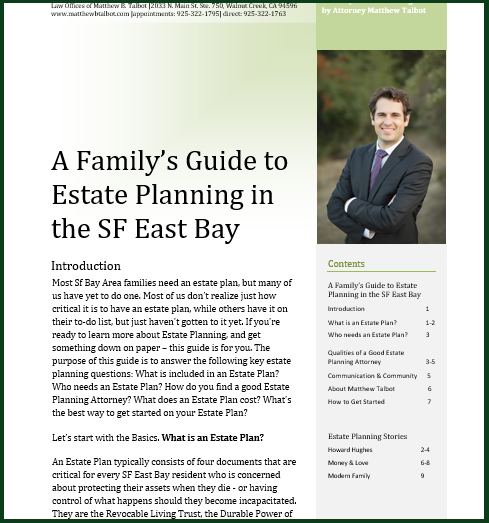 Top Trust and Estate Attorney Matthew Talbot explains how an Estate Plan will benefit families and individuals in the San Francisco East Bay. He addresses what an estate plan includes, the advantages of hiring an experienced attorney vs. doing it yourself, and how a good estate plan can save you and your family thousands in attorney fees. Attorney Matthew Talbot answers your questions about the probate process in California. The Durable Power of Attorney allows you to appoint someone to act on your behalf with regards to financial affairs. Attorney Matthew Talbot answers questions about this important legal document, as well as outlines why it is essential to have one. Also known as a "Medical Power of Attorney" and "Living Will," the Advance Healthcare Directive allows you to appoint an agent to act on your behalf in regards to medical affairs. It also specifies your wishes for care and life prolonging treatment. Mr. Talbot addresses why the Advance Healthcare Directive is essential for residents of the SF East Bay.